The Isle of Anglesey is treasured by visitors and residents alike for its natural beauty, but it is also the home of a wide range of interesting and striking historic buildings. Local author Warren Kovach, founder of the Anglesey History web site, takes you down the 400 steps to the South Stack lighthouse, teaches you how to pronounce the name of Llanfairpwllgwyngyllgogerychwyrndrobwllllantysiliogogogoch railway station, introduces you to the philanthropist Sir John Prichard Jones, who built a library and charitable institute in his home village, pausing only for refreshments at the Ship Inn at Red Wharf Bay. Also featured are the magnificent bridges crossing the Menai Strait, a fully restored 17th century thatched cottage and Wales’ only working 19th century windmill. 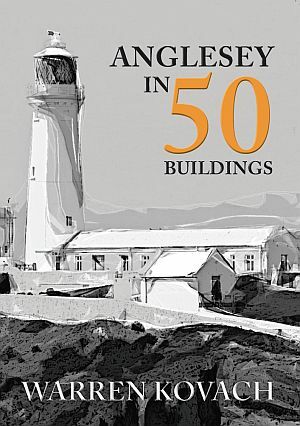 From ancient castles and an Iron Age village, through medieval manor houses and Victorian industrial works, to an architecturally modern church and a new factory harvesting the salt of the sea, Anglesey in 50 Buildings guides you around the island's history through a selection of its greatest architectural treasures. This book will be an excellent companion to those who are discovering the island for the first time, as well as long-time residents who want to learn more about the history of the buildings they walk past every day. A list of the places illustrated is given below, along with an interactive Google map showing exactly where each modern photograph was taken. Warren Kovach is the author of the Amberley book Anglesey Through Time, as well as the popular Anglesey-History.co.uk website, which highlights aspects of the island's history, supplemented by many of his own photographs. Born and raised in Ohio, USA, he moved to Anglesey in the early 1990s and soon set about exploring its history and landscape. He has a PhD as a researcher in biology, ecology and palaeontology, but later moved to developing scientific computer software. He is a keen photographer and has had his photos published in many national newspapers, books and magazines around the world. He is also a trustee of the Menai Bridge Community Heritage Trust. You can follow him on Twitter at @AngleseyHist or on the Anglesey History Facebook page.